Plants need water. Caring for plants means you’ll have to water your plants. 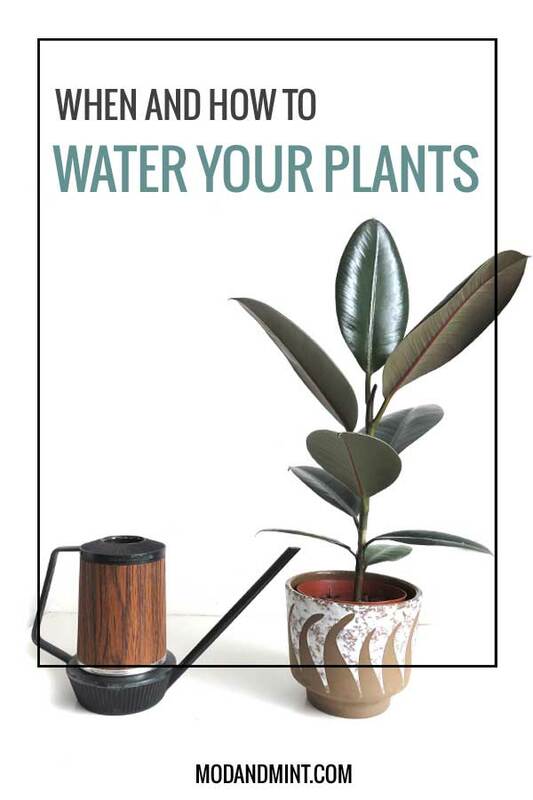 But when do you water your lovely houseplant? And how much water to give? The number one reason that plants die is because of overwatering. 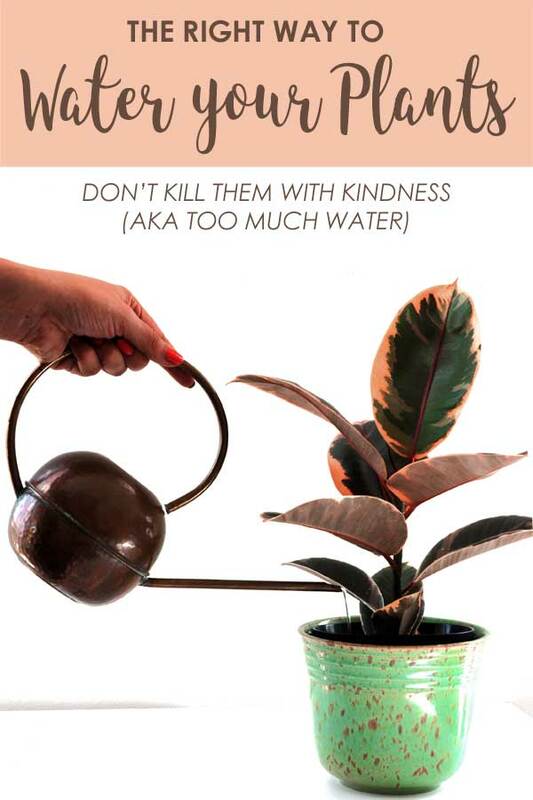 Too much water can kill your plant. Many times I hear people say they water on a schedule, like every Sunday morning. But how do you know your plant is thirsty every Sunday morning? Another common one is the plant is looking sad, so you give it water. The next day it still doesn’t look happy, so you water some more. And some more. A lady once told me, I’ve been watering my plant every day. I don’t know why it died. Its roots drowned in all that water. No shame. A lot of plant parents go through this. I know I have. For me, it was a large Croton Plant that I had put in a very dark corner of my first apartment. I was clueless. It started to look sad. So I watered it. I watered it way too much, not giving the soil time to dry out, and the roots got no opportunity to breathe. The Croton dropped its leaves and died. I paused and took a moment to figure out what went wrong. 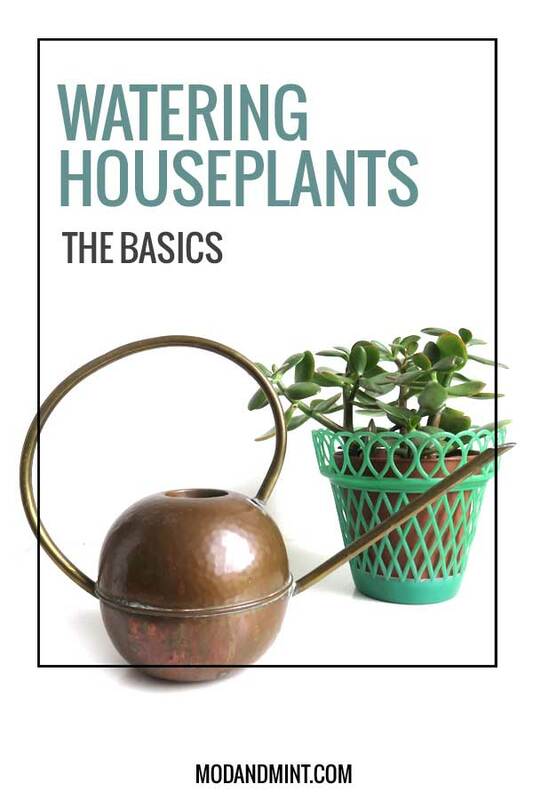 Once I figured out the basic plant watering guidelines, I knew what to do better with my next plant. 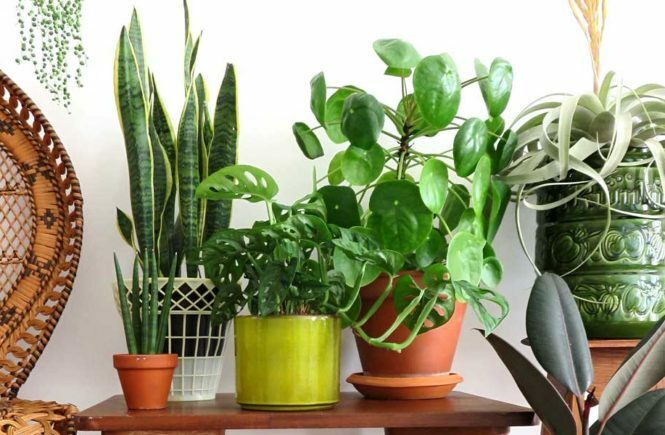 With a few exceptions to the rule, most houseplants will be happy if you care for them following these simple guidelines. Keep the plant in a pot with drainage holes on the bottom. Water only after you’ve checked that the soil is dry. Water the plant until water comes out of the drainage holes. Don’t let the pot sit in standing water. Water and fertilizer for that matter are not magic plant elixirs. Too much of it can do your plant a lot of harm. Too much water and the roots can drown and start to rot. Too much fertilizer and the roots can burn and shrivel up. Next, the plants’ leaves start to wilt away. Adding more water will only speed up the deterioration. Less is more. There are a few ways to know when it’s time to water your plants. First, look at the leaves. Get to know your plant. Inspect it, and don’t be afraid to touch it. Healthy plants have firm leaves. They droop or wrinkle when the plant is thirsty. Lift the plant up. Pot and all. Does it feel heavy? If it does, there is still enough water in the soil. Light as a feather? The plant is dry and asking for water. Check the soil. Get up close and personal with your plant and stick your finger into the potting mix, down to your knuckle. If it feels moist, don’t water. If the soil feels dry. Go ahead. It’s time to water. If the top of the soil is dry, but the deeper layer is still moist, wait one or two days and check again. If you are in doubt, wait a day. Then water. Better to underwater than overwater. How much to water your plant? When it’s time to water, don’t be scared to give your plant a good thirst-quenching soak. You want to water until water comes out of the holes in the bottom of the pot. Think about it. We’re mimicking the plants’ original habitat. Watering the plant is to make it rain. Literally. Let the soil dry out completely before watering again. 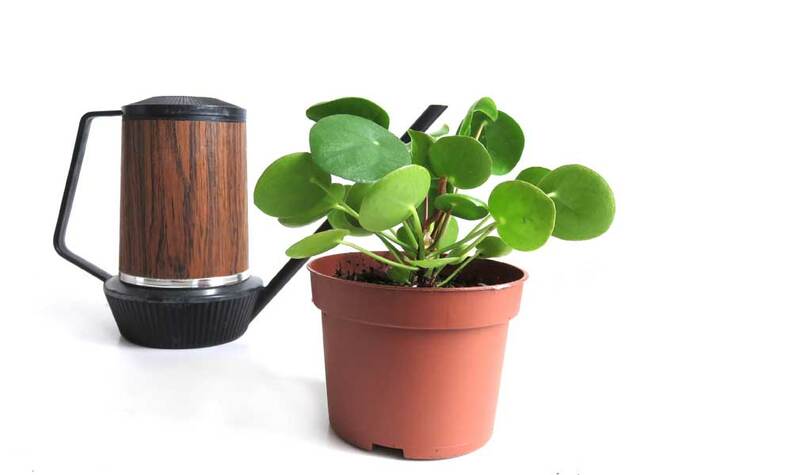 If there is any excess water on the drip saucer after watering, empty it. There are certain times that plants require more or less water. In summer, when plants are actively growing, they need more water than when it’s winter, and they are in their resting period. Also, plants in clay pots need to be watered more frequently than pots in plastic containers. And plants in small pots need watering more often than plants in larger pots. Overwatering does not mean you gave it too much water at once. Overwatering does mean that the soil is kept continually too moist. The plants’ roots can’t breathe and don’t get a chance to dry out. This will cause the roots to be more prone to diseases, primarily root rot. And root rot can kill your plant fast. How do you know if you overwatered your plant? The most common signs of an overwatered plant, are droopy, wilted leaves, in combination with soggy soil. The wilting resemble signs of too little water. When you see this, it might be tempting to give more water. But don’t. Check the soil first. If it’s still moist your plant might be in trouble. Yellow leaves, mushy stems and mold on the top of the soil are also signs of overwatering. 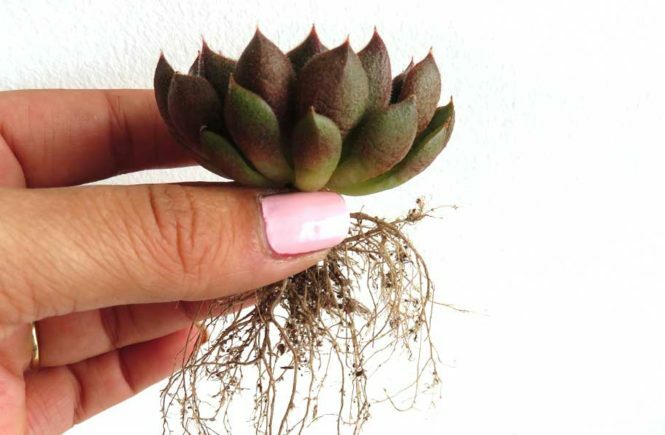 What to do if you overwatered your plant? When you catch it early enough, you might have a chance to save an overwatered potted plant. You want to examine and treat the roots and repot the plant. Gently take the plant out the pot and take a look at the roots. If there is root rot, you will see brown and mushy roots. Maybe even an unpleasant scent. Carefully prune away as much of the affected roots as possible so only healthy roots remain. 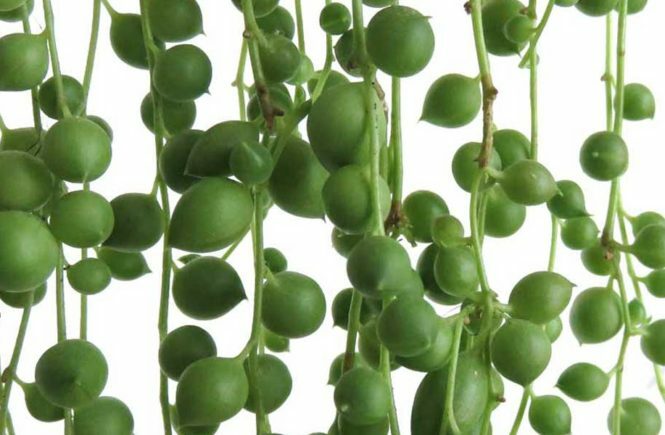 If you end up having to remove a lot of the root system, it is wise to also prune some of the plant itself. The roots should be in proportion with the plant to be able to sustain. Re-pot the plant in fresh soil and water gently. No need to soak the soil this time. Put your plant in a bright spot, but keep it out of direct sun while it recovers. RELATED POST: When and How to Re-pot Houseplants. What to do if you underwatered your plant? You can’t remember the last time you watered. The leaves of the plant are wilting. The soil is bone dry and is starting to pull away from the sides of the pot. These are sure signs of an underwatered plant. An underwatered plant is easier to save than an overwatered plant. All that an underwatered plant basically needs is a good watering. Easy enough. Go for it. But if you notice water going straight through when you water, it could be that the soil got so dry it needs some extra care and re-hydration. To do this, fill a bowl or tub with water and put the pot in it. It will take up water through the drainage holes on the bottom. Let it soak up water until the soil is hydrated. After this, you can resume normal watering practices. You can also rehydrate by watering a couple of times in a row. Water the plant thoroughly. Let it stand for about half an hour, giving the water time to soak into the soil, and water again. Wait another half hour and water one last time. By doing this, the water gets the chance to get deep into the soil. 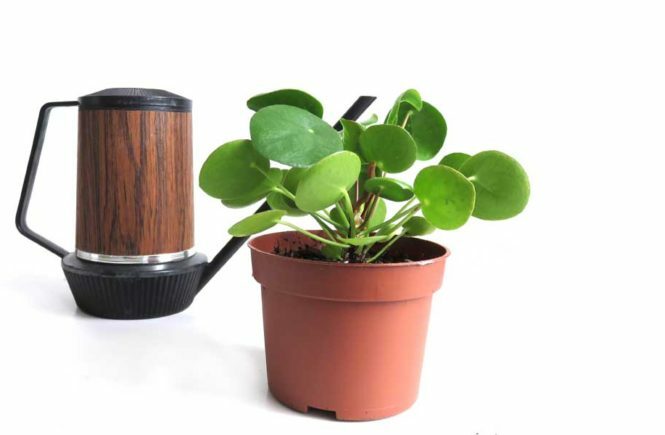 Your plant will get a good drink and should perk right back up.